The Ellen Report ...: Oh Sh*t she still Knits. Oh Sh*t she still Knits. Sorry for the crass title, but I live for a bad rhyme and a knit joke. Anyways, lookee here some finished knits! A few years ago I knit a Gramps sweater for a coworker of my husband's who has always been so supportive of him. And well she was having baby 2 and knowing that her kid actually wore it he asked if I'd consider knitting the family something else. He was originally thinking a replacement sweater for the eldest since he had grown out of the original and the new little would get it, but I thought, why not something new for both. Seemed like a great idea at the time. I chose patterns I had knit before (practical) and gave myself a reasonable size and timeline for both. Shamefacedly 5 months later I am finally finishing them. My knitting mojo was hit or miss 2018 and honestly, I've just been so tired mentally and physically at the end of the day. I basically wait for everyone to go to sleep (not that anyone asks much of me) and then shut down. And in all fairness, I have been enjoying other hobbies as well. Okay I just have to say the Navy is heathered and it still caused me all kinds of eyesight problems. I dropped stitches that I didn't find until AFTER I bound off the body. I dropped stitches yet again during short row collar shaping and could not figure out how to fix it so I had to tink back hundreds and hundreds of stitches over a week. Then literally 3 rows from binding off brand new knitters pride needles I purchased for this project "snapped" (the line from the needle) and I dropped a buttload of stitches and had to keep from screaming in the middle of the night. It was a journey. One I do not plan on taking for a while. So people do me a favor and slow your roll with the babies. 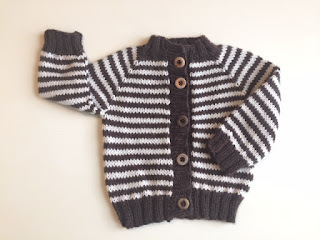 I've already cast on my next project another sweater for a grown person. A new to me pattern, so I have to really think but who cares, the yarn is a blue gray so I can SEE my stitches (insert cackling laughter here). I also still have a pair of man socks I need to finish. I'm trying a higher cast on this time. How many rows do you guys usually make for your man sock legs? I think I did 70 but it seems short? Oh well, it is what it is now. I do 68 rows for Steve's socks, but he is a fairly short-legged man. Neither one of us is particularly tall. Okay this is good, gives me something to go with. I realize it's a preference, but I knit about the same. Thanks! Great finishes. And it doesn't matter how long it takes, as long as you enjoy it! For man socks, I don't go by rows, but inches. I usually do Dave's between 6 and 8 inches long depending on how I'm feeling about giant man socks at the time. I think I should really start thinking in terms of inches. This is the way to go. I think the problem is I'm so used to knitting socks for myself that I gravitate towards my personal recipe if you will. LOVE the Gramps cardigan! 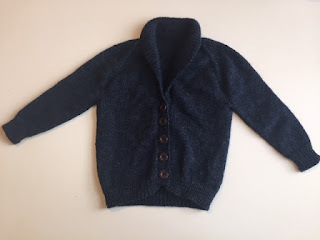 Your title made me LOL and when I read about the dropped stitches, I said, "Oh sh*t."
It was ChrisKnits who first suggested this pattern and it's not quite as narrow in the body as the Baby Sophisticate and has lots of size choices which I appreciate. And yes, I feel like I'm butter needles these days! Adorable cardis! Dark colors are tough on my eyes, too. I usually knit between 8-9 inches for the leg portion of man socks. I hope all goes well for the new pattern. I think I really need to try and think in terms of measurements for socks, especially for men. This is the way to go. So far it's been an interesting project! I'll post on the progress next week. Slowly but surely, you know me! Ah these are lovely. I do like dark colours but yes unless you can knit without looking it is a bit of a bind on the eyes. Indeed Mitzi! I think I need to save my dark colors for day light. This just means I have a nighttime and daytime project, right? hehe. Thank you for reading the post and commenting! How nice they turned out! And they don't tell the horror stories of the 'oops!' moments! Thank you! I honestly hope I have secured all Oops as needed! Nice cardis! Those dark colors are a PITA to knit with, I think. I make the man socks about 75 rows, sometimes 80. Thank you, Vera. I'm worried all I'm going to knit is neutrals and pastels now. LOL I'll be knitting one big 80's GAP campaign. ha! See I knit about 60 - after a 10 row rib for myself so this makes sense! Wow, is this proof of life or something? Lovely knits both! And dare I say you would be able to see the navy better if you weren't hanging out in bars all the time? LOLOLOLOL!!! Wait, did I say that? Those sweaters are a treasure!!! I cannot knit with dark yarn very often. I have the same issues. Just don't see the stitches well and make too many unforced errors...as they say in Tennis! Do you think if I knit with big yarn and big needles it would be better? I hope so, because I have a big bulky black stash of yarn that needs to be turned into a blanket. Yikes! Oh, my heart!!! Those are fabulous. Well done, you! Thank you. You know I adore you, right? Nice work on the sweaters, and you deserve lots of extra points for the navy sweater. I think I'd have ripped out or maybe even chopped it up in frustration! Will be anxious to see the new sweater pattern, too. For you, I hope? I'm laughing because I believe the words "chopped" came to mind more than once with that blue yarn. The new sweater pattern is for my friend, but she's small, petite, but fit. I'll post some progress soon. It's a different construction for me. Not fast, but interesting for sure! beautiful!! Love the sweaters and the swear word in the title!! I knew you were knitting, by the way. I love them and no one will ever even notice an error, they are beautiful and will be cherished. I also love a good swear word, sometimes nothing else works! Thanks Mere, and honestly I'm not proud of it, but I could've swabbed a deck or two the way I can use an adjective. I do try to be more mindful of it, because people who don't know me will think I'm even angrier or crazier than I really am. The sweaters are adorable and they look perfect. I've heard such good things about that pattern. I really must try it! 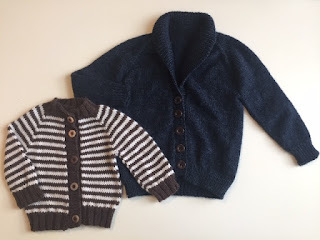 Yes, try it next time you're in the need of a baby/kid cardi. ChrisKnits turned me on to it, and she knows what she's talking about. Hi Ellen! I want to try to have all my fave blogs notify me of a new post . I tried to subscribe to post below but it didn't work ...???? Such handsome sweaters both! I have the same problem with dark yarns & have to blast out my craft light whenever I knit with them. Oh the joys of getting older :) No useful recommendation for the man socks since I have yet to cast on for one. Maybe 72 stitches? It sounds like a good solid number & divisible by 8.